This is a guest post by Laura Leegood. Gadget fans around the world are buying up tablet computers at an ever-increasing rate, and a huge number have been sold. With a size and weight somewhere between laptops and smartphones, they provide the ideal combination of portability and usability. Their larger size and high-quality graphics makes them ideal for playing games, reading books and news, and watching videos. Most tablets also offer the ability to download Facebook and Twitter apps, making social media consumption significantly easier. As well as consumers, they have also been extremely popular in the business world. Their uses in the workplace include attorneys responding to clients, medical professionals accessing health records during patient exams, and managers approving employee requests. Tablet computers received an immediately positive reception upon their release - the Apple iPad caused pandemonium, with thousands of fans queuing up outside stores to purchase their own. When the first-generation Apple iPad was announced in 2010, tech enthusiasts were naturally curious about a new kind of technology, and eager to find out the possibilities the iPad brought with it. But the ensuing demand was unprecedented, quickly moving beyond its tech niche to mass-market appeal, with 14% of all online shoppers saying they plan to purchase an iPad in the next five months. It also spawned a multitude of copycats, with varying degrees of success. Other popular tablet computers have since been launched, offering a different array of features and at a more accessible cost than the original iPad. For example, this BlackBerry PlayBook review points out that its inclusion of Adobe Flash 10.2 support means it “finally makes good on the iPad’s promise to put the whole Web in your hands.” Other tablets that run an Android operating system, such as the Samsung Galaxy Tab offer better integration with Google’s programmes such as Gmail and Google Docs. The tablet computer’s popularity has had repercussions outside of its own market. Growth of laptop and notebook sales plummeted in the months after the iPad’s release, and this data is reflected in public opinion. Although globally sales of laptops still dominate, many tablet users feel that their tablet replaces many of the tasks they used to perform on their laptop. “What the tablet did was completely cannibalize the netbook,” remarked Michael Hurlston, a senior vice president at Broadcom Corp., which supplies microchips to large computer and tablet manufacturers. Furthermore, the popularity of tablet computers has affected the gaming industry, since purchasing a handheld gaming system loses its appeal if you could buy a device of the same price that did everything that gaming system does and more. And although e-book readers are growing in popularity, tablet computers provide convenient and portable e-book readers as well as a host of other functionality. iPad subscriptions are available for most major magazines. However, there are some elements of the classic laptop that a tablet computer cannot improve on, and so it seems that laptops are unlikely to vanish from stores any time soon. The laptop’s physical keyboard makes large amounts of text input or creative production much easier than it would be on a tablet’s touchscreen, and many find the tactile familiarity of a physical keyboard a more enjoyable experience. Laptops are also able to burn CDs and DVDs, and have the additional memory to store large amounts of music and photos. A portable tablet computer is never going to have the screen size that a desktop or even laptop computer appealing. Approximately 32,000,000 tablets have been sold worldwide to date. 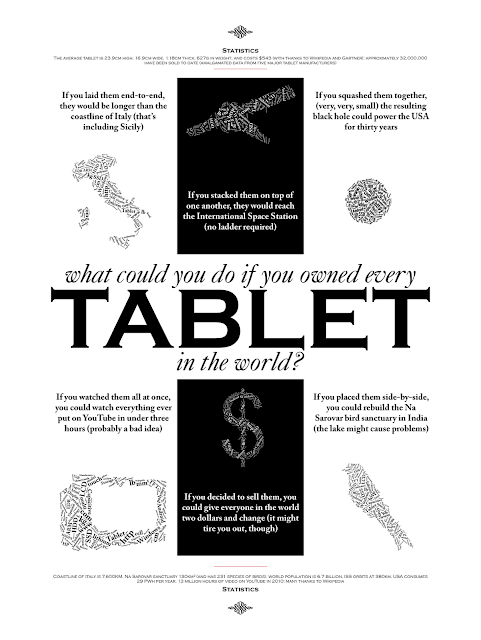 The below infographic helps you visualise what it would look like if you owned all of these 32,000,000 tablets.